How to eat pizza and stay fit? The most frequently asked question is how I manage to eat so much pizza and not get fat. 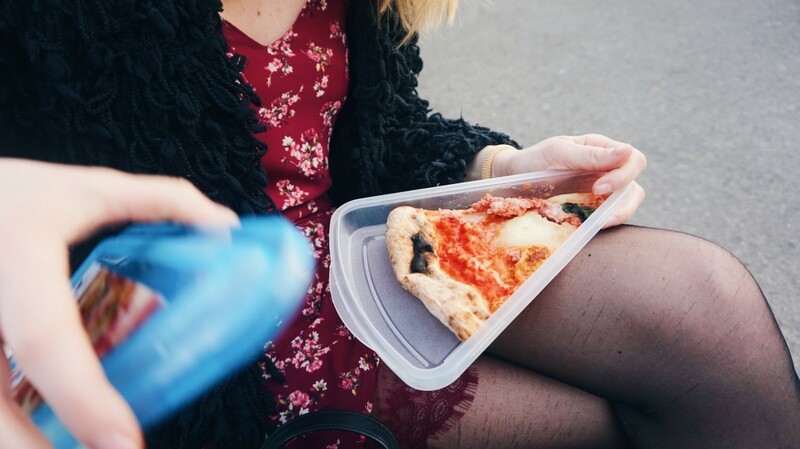 I know it sounds crazy but I’ve decided to write an article revealing my recipe for a success and hot body – welcome to my own guide to how eat pizza a couple times a week and not gain weight! A year ago I was preparing for my life journey and biggest adventure – taking the Erasmus programme and moving to Florence! As you all know, Florence is located in Italy. And I totally love pizza. Do you see where I’m going? 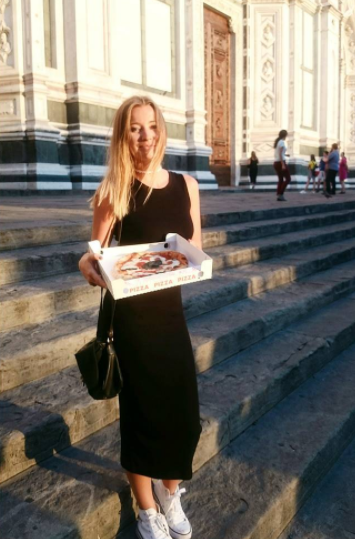 Me + Italy + tons of pizza. Well, I guess it’s quite obvious that I don’t eat pizza on a daily basis when I’m in Poland – there’re not so many great pizzerias (but it’s changing very fast!). 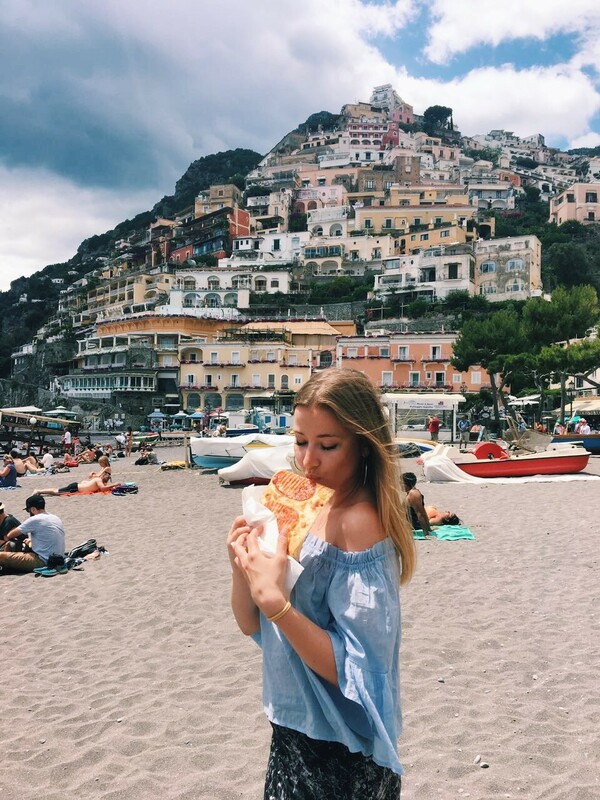 However, Italy… It is completely different and delicious pizza awaits on every corner. Maybe I just got lucky and by choosing Florence I didn’t get fat. And I owe it to the fact that pizza in Florence is really expensive… Thanks to that issue I didn’t get the chance to eat it daily (thanks God). Sometimes when I was starting to miss eating pizza in the more regular way, I was looking for some solutions. Here’s how my plan looked like: I found some other #pizzalover and we shoot off to our own pizza heaven. We shared our delicious meals and didn’t spend so much money as a result. Thanks to that, our eternal love for pizza was spreading and my calories weren’t Titanic-sized. 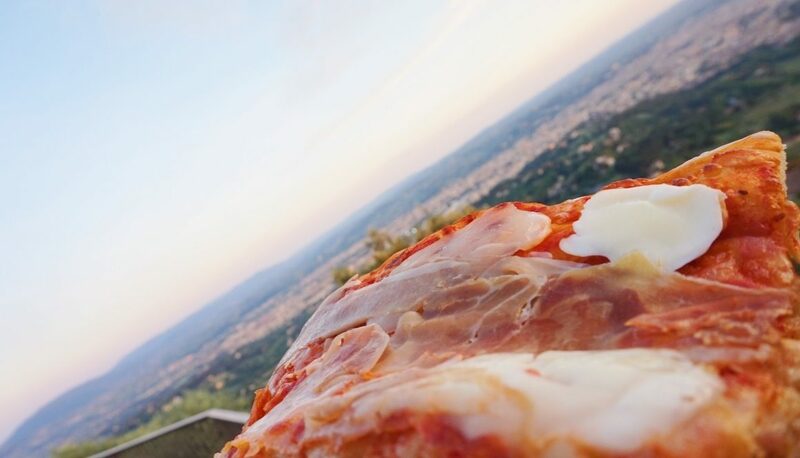 Well, this is just a short introduction to how I rationally ate pizza in Florence (by the way check my Florence pizza guide!). I would like to give you some detailed and practical advise that might help you survive in this kingdom of pizza. I guess my ideas really helped me survive this trial – as a matter of fact, I lost 4kg! Remember – it is not scientifically proved, you read it on your own responsibility! I got this habit from Madrid, where I was working for two months during summer holidays. It was really hot there so I wasn’t leaving my flat without at least 1,5l water bottle. Of course, living in Florence was quite alike. No matter how the weather was, I always drunk a lot of liquids. I guess it just got under my skin. Now, after getting used to it, I just have the urge to drink water. If I’m missing my daily dose I feel exhausted and irritated. Now, during my 8 hour shift at work I always drink 1,5l of water. I’ve heard a lot of good about this idea. Unfortunately I lack regularity and determination, so I wasn’t able to keep it going longer than 4 days. However, after moving to Florence I didn’t have to wake up before dawn and I had some time to bustle around kitchen for a while. After some time it turned out that drinking water with lemon in the morning became my daily routine. I guess this it a top priority tip in this article. I believe that I didn’t gain weight mainly because I was going on foot basically everywhere. I don’t know how many kilometers a day I was handling. Florence is not so big… And there is no point in commuting by bus. While being in Poznań or Wrocław I would use public transportation even in order to get to the next nearby stop. In Florence it just didn’t make any sense. So I was walking. To the university, to the shopping, to my friends living on the other end of the city and to pizzerias too. Well, Florence is encouraging when it comes to going on foot – there are so many beautiful places that walking around is a pure pleasure. And if you want to eat a lot of pizza, walking will be necessary! I think that living on the fourth floor kind of rescued me from gaining weight. I had to face those steep steps manifold times a day. Everyday stairs-cardio – thank you pizza goddess from saving me from fat and accommodating me in such uncomfortable place! Well, I won’t lie – I didn’t manage to achieve it fully. When I wasn’t travelling or facing my examination session I tried to find 20-30 minutes to jog. It’s important to treat your exercises as a pleasure and not as a duty. I used to exercise at the gym or at home with Chodakowska – in fact it didn’t give any happiness and I was tired of the fact that I have to do something at all. I enjoy running and dancing – that’s why I try to transfer my physical effort into something that makes me happy. It’s better to run for 15 minutes, 2-3 times a week than to be super fit for a month and then stop. During studies I used to drink various alcohols. Usually it was a beer as I wasn’t keen on drinking wine (especially dry one). Well, one month in Italy was enough to change my preferences and I’ve learnt to love red wine – both semi dry and dry. I don’t really know how it works in fact, but I believe that when in moderation, it’s healthy and improves your digestion. Two glasses of wine after eating your dream pizza might only be useful! It is very important! If you eat a “polish pizza” that is stuffed with various ingredients, may-based garlic sauce and weird pastry, the above mentioned tips won’t be useful. I believe that traditional Italian pizza that is based on fresh tomatoes, high-quality flour, mozzarella and olive oil will be your best choice. And if you add some arugola? It’s just like a salad! Gluten or sweets. I chose pizza. I don’t feel the urge to eat sweets or I feel it rarely. Maybe once a year I buy a bar of chocolate. Usually I prefer some kind of cakes but still, it happens rarely. It is the same with soda. I don’t drink juices, Fanta, Cola or Sprite. Maybe sometimes in the summer I’d have some Cola or just to kill a hangover. Usually I try to avoid it. It seems so obvious but sometimes we simply forget about it. Do what you love. Meet people you like, spend time together. Enjoy little things – like pizza! I don’t know how to explain it but I believe that it improves your mood – therefore you’ll become more relaxed and fit. Treat this article as something for fun. 🙂 I don’t want to convince you to imply those tips and I won’t guarantee that they will work for you! You have to find your own ideas how to eat pizza a couple of times a week and not gain weight! And maybe you already have some techniques? Let me know below!